© 1999 Creation Ministries International. he hand-written note pinned to some photocopied pages was typical. ‘I wonder if you could help with a geological problem ...?’ The writer, a Bible-believing Christian, was confused. He had just encountered some tired old geological arguments attacking the straightforward biblical account of earth history — i.e., denying a recent creation and a global Flood on the basis of ‘geological evidences’. Because the ‘recent creation model’ he refers to is simply what the Bible plainly says, he has really been caused to doubt the Bible. The unsuspecting readers of such books, thinking they are getting something from ‘Bible-believing Christians’, expect encouragement and faith-building material. They are generally unprepared for the explosive mixture of heretical theology, poor science and vehement attacks on Bible-believers. For example, the author Alan Hayward claims to be a ‘Bible-believing Christian’. However, he is a unitarian, which means he denies the tri-unity of God. The deity of Christ is clearly taught in the New Testament (e.g. John 1:1�14, 5:18; Titus 2:13; for more information, see Is Jesus Christ God?, How can one God be three persons? and the very detailed study of biblical evidence for the Trinity) — yet Hayward denies this. Clearly, ‘Bible-believing’ Hayward chooses to reinterpret those parts of the New Testament with which he disagrees. He works the same way with the Old Testament. Instead of accepting the clear teaching of Genesis, he reinterprets the passages to fit his billion-year preference for the age of the earth. In so doing, of course, he introduces confusion and problems that destabilise readers. We are warned to beware of teachers who vandalise the clear teaching of Scripture to fit with their philosophy (Colossians 2:8). Superficially, Hayward amasses an impressive battery of arguments as to why the Bible can’t mean what it says. Perhaps the single most important lesson from his book is his strategy itself. Each of his attacks on the Word of God elevates some other ‘authority’, whether derived from geology, astronomy, secular history or theology, above the Bible. This approach is as old as the Garden of Eden. True knowledge begins with the Bible (Proverbs 1:7, Psalms 119:160; 138:2), and that is where we need to start. God was there when He created the world. He knows everything, does not tell lies, and does not make mistakes. It is from the Bible that we learn that the world is ‘young’. If the Bible taught that the world was millions of years old, we would believe that. However, the concept of millions of years of death and suffering contradicts the Word of God, and destroys the foundation of the Gospel of Christ. Many people find it difficult to accept that scientific investigation should start with the Bible. They think we can answer the question about the age of the earth by coming to the evidence with an ‘open mind’. In fact, no one has an open mind. Evidence does not interpret itself; rather, everyone views the world through a belief framework. Unfortunately, as humans we never have all the information. So, when we start from the evidence, we can never be sure our conclusions are rightlike in a classic ‘whodunnit’, just one piece of information can change the whole picture. By contrast, when we start from the Word of God, we can be sure that what it says is true. Even if we can’t answer some of the apparent problems now, we can be confident that there is an answer. We may not find out about the answer on this side of eternity, but that would simply be because we did not have all the information necessary to come to the right conclusion. On the other hand, ongoing research may reveal the answer — and it often has, as we will see. On first appearance, the evidence that Hayward assembles seems so overwhelming. But the problems he describes are easily answeredindeed many answers were known before he wrote his book. Either he was unaware of the answers, or he deliberately ignored them. Let’s look at some of the ‘science’ he presents so persuasively. A common argument against the Bible involves varvesrock formations with alternating layers of fine dark, and coarse light sediment. Annual changes are assumed to deposit bands with light layers in summer and dark layers in winter. It is reported that some rock formations contain hundreds of thousands of varves, thereby ‘proving’ the earth is much older than the Bible says. But the assumption that each couplet always takes a year to form is wrong. Recent catastrophes show that violent events like the Flood described in Genesis can deposit banded rock formations very quickly. The Mount St. Helens eruption in Washington State produced eight metres (25 feet) of finely layered sediment in a single afternoon! And a rapidly pumped sand slurry was observed to deposit about a metre (3�4 feet) of fine layers on a beach over an area the size of a football field (cross-section shown on the right: normal silica sand grains are separated by darker layers of denser mineral grains like rutile). When sedimentation was studied in the laboratory, it was discovered that fine bands form automatically as the moving water transports the different sized particles sideways into position (right). Surprisingly, the thickness of each band was found to depend on the relative particle sizes rather than on the flow conditions. A layered rock (diatomite) was separated into its particles, and when redeposited in flowing fluid, identical layers formed. It is unthinkable that these dead animals could have rested on the bottom of the lake for decades, being slowly covered by sediment. Their presence indicates catastrophic burial. It is often claimed that the fish and birds remained in prime condition at the bottom of the lake because the water was highly alkaline and this preserved their carcasses. Yet highly alkaline water causes organic material to disintegrate, and that is why alkaline powder is used in dishwashers! Another problem for the varve explanation is that the number of bands is not consistent across the formation as it should be if they were annual deposits. Similar bands in some huge deposits containing calcium carbonate and calcium sulphate in Texas are also used to argue the case for long ages. One explanation says the deposits were formed when the sun evaporated seawater — hence the term ‘evaporite deposits’. Naturally, to make such large deposits in this way would take a long time. However, the high chemical purity of the deposits shows they were not exposed to a dry, dusty climate for thousands of years. Rather, it is more likely that they formed rapidly from the interaction between hot and cold seawater during undersea volcanic activity — a hydrothermal deposit. Another claim of bibliosceptics is that there are ‘too many fossils’. If all those animals could be resurrected, it is said, they would cover the entire planet to a depth of at least 0.5 metres (1.5 feet). So they could not have come from a single generation of living creatures buried by the Flood. Not surprisingly, the substance disappears when the detail is examined. The number of fossils is calculated from an abnormal situationthe Karroo formation in South Africa. In this formation the fossils comprise a ‘fossil graveyard’the accumulation of animal remains in a local ‘sedimentary basin’. It is certainly improper to apply this abnormally high population density to the whole earth. The calculation also uses incorrect information on today’s animal population densities and takes no account of the different conditions that likely applied before the Flood. Another argument used against the Bible time-line is that the pre-Flood world could not have produced enough vegetation to make all the coal. But again, this argument is based on wrong assumptions. The pre-Flood land area was almost certainly greater before all the Floodwaters were released onto the surface of the earth. Also, the climate was probably much more productive before the Flood. Furthermore, it has been discovered that much coal was derived from forests which floated on water. So, calculations based only on the area of land would be wrong. And finally, the estimates of how much vegetation is needed are based on the wrong idea that coal forms slowly in swamps and that most of the vegetation rots. The Flood would have buried the vegetation quickly, producing a hundred times more coal than from a swamp. The petrified forests of Yellowstone National Park have often been used to argue against Bible chronology. These were once interpreted as buried and petrified in placeas many as 50 successive times, with a brand new forest growing upon the debris of the previous one. Naturally, such an interpretation would require hundreds of thousands of years to deposit the whole sequence and is inconsistent with the Bible time-scale. But this interpretation is also inconsistent with the fact that the tree trunks and stumps have been broken off at their base and do not have proper root systems. Furthermore, trees from different layers have the same ‘signature’ ring pattern, demonstrating that they all grew at the same time. Rather than 50 successive forests, the geological evidence is more consistent with the trees having been uprooted from another place, and carried into position by catastrophic volcanic mudflowssimilar to what happened during the Mount St. Helens eruption in 1980, where waterlogged trees were also seen to float and sink with the root end pointing downwards. The origin of pitch is also used to ridicule the account of Noah in the Bible. Pitch is a petroleum residue, we are told, and creationists say that petroleum was formed by the Flood. So, where did Noah get the pitch to seal the Ark (Genesis 6:14)? This old argument stems from ignorance of how pitch can be made. The widespread use of petroleum is a 20th century phenomenon. How did they seal wooden ships hundreds of years ago before petroleum was available? In those days, pitch was made from pine tree resin. 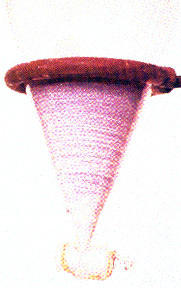 A huge pitch-making industry flourished to service the demand. Some attempts to discredit the Bible are wildly absurd — like the idea that there is too much sedimentary rock in the world to have been deposited by the one-year Flood. It is claimed that the Ark would have floated on an ocean of ‘earthy soup’ and no fish could have survived. This argument takes no account of how water actually carries sediment. The claim naively assumes that all the sediment was evenly mixed in all the water throughout the Flood year, as if thoroughly stirred in a ‘garden fishpond’. Sedimentation does not occur like this. Instead, moving water transports sediment into a ‘basin’ and, once deposited, it is isolated from the system. The same volume of water can pick up more sediment as it is driven across the continents, for example, by earth movements during the Flood. 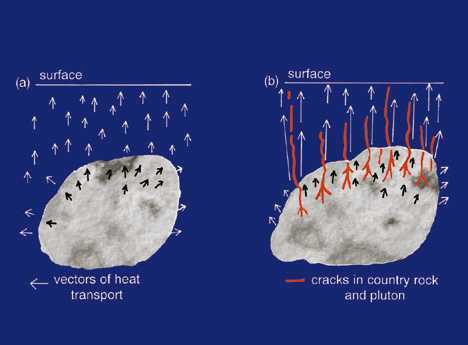 Below: Cooling of a granite pluton by (a) conduction and (b) convection. The sizes of the arrows are proportional to the rate of heat flow to the surface. Convection dissipates the heat along fractures very quickly. The section above shows some of the other arguments along this line that were once claimed to be ‘unanswerable’. If this article had been written some years earlier, we would not have had all those answers. We still don’t have all the answers to some others, but this does not mean that the answers don’t exist, just that no-one has come up with them yet. There may be new arguments in the future alleging to ‘prove’ that the Bible, or one of the previous answers, is wrong. And when these are answered, there might be new ones again. That is the nature of science. All its conclusions are tentative, and new discoveries mean that old ideas must be changed — that is why creationist research is important. But science ultimately can’t prove or disprove the Bible. Faithbut not a blind faithis needed. It is not the facts that contradict the Bible, but the interpretations applied to them. Since we never will know everything, we must start with the sure Word of God in order to make sense of the world around us.